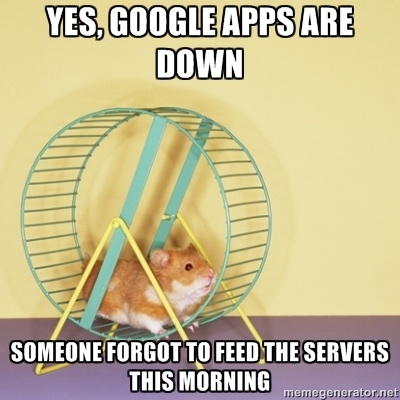 Google has been having a rough go of keeping their cloud services up and running smoothly for all users lately. Today is just another example of the sporadic nature of Google Apps “up time” as of late. Besides the general headache of lost instructional time that an important educational cloud-based server being down causes, Google’s customer service (or lack thereof) isn’t as robust as many would like it to be. That leaves many Google Apps users to take to Twitter and other social networks just to figure out what’s going on. In my mind, that’s pretty crummy, and leads to all sorts of back and forth speculation as to the cause. Some individuals experience no outages whatsoever, while others have sporadic use of some of their apps. Enter the Google Apps Status Dashboard. It’s not the best tool in the world for keeping up with service outages in real time, but at least it’s a place to start. While it did take at least 45 minutes from the time outages started appearing this morning and the first “problem” was indicated on the Apps Status Dashboard, you can rest assured that if there’s any hint of an orange or pink indicator light on one of the apps, there’s certainly a problem with other apps in Google’s stable. Granted, this gives little comfort to those of us savvy enough to br prowling Twitter for updates on the situation. @kjarrett The Apps Status Dashboard is such a joke. It will be updated at 3pm today after all is cleared up. I’m with Daniel on this one, Google could REALLY step up their reporting of outages and real time status updates of Google Apps. However, there are many educators and technical folks in school districts that are completely in the dark when Google Apps go down. Either they aren’t connected on Twitter, or have other re-occuring problems in their district with bandwidth, filtering, or some other internet related malady. For them, the Google Apps Status Dashboard is at least a starting place to make sure it’s “not just them” when Google’s services go down. From there, it’s wise to head over to Twitter to check out the situation. And then complain a bit (or a lot) to Google that offering up more timely information on what’s happening would be appreciated. If anyone else has a starting place for checking on Google’s outages, I’d love to know! Until then, someone get back to work on getting those servers back up and running! @techsavvyed Ben, http://t.co/DGJnpuGSOP seems to do a better job of reporting outages than Google or other services. David Prindle shared an excellent website that I hadn’t seen before called Down Right Now. It appears to list more than just Googles services, including Facebook, Tumblr, Skype and many other social and cloud services. This is certainly a great “go to” for future outages across a number of sites. While it doesn’t seem to offer the exact details as to the nature of each outage (you would still have to visit the service provider’s site for that level of information), it does have the great advantage of individual internet users being able to report outages. The loss of instructional time is a killer. We were working in forms this morning to help us pick literature circles for a humanities class. No one was able to access the form, thus, we were scrambling on what to do. I’ve had entire power outages take out my computers before, so whenever I plan on something that involves online or tech tools I always make sure there’s some reasonable paper-based facsimile as a backup. Of course, that’s not always feasible, considering how much more efficient Google Forms are than paper and pencil. Here’s to hoping Google Apps comes back soon! I used to work in a college media center that loaned out equipment. Our reservation system was in Google Docs, so if it went down we were completely in the dark about who had reserved what. We eventually got in the habit of downloading the spreadsheet at the end of the day, so that we would have it as a back-up the next day. Same-day reservations were still a problem, but a lot easier to cope with than having to scramble for ALL reservations. I was also a member of the Google Apps support team there, and pretty much we only got status updates from Google if we called our account manager. It was a little ridiculous. One of the attractions of cloud services is supposed to be that there is minimal down time because everything is distributed, but that doesn’t mean there shouldn’t be a plan in place for how to communicate with customers when something does go down. Your story illustrates an excellent example of why many in education have been leery about cloud-based systems. Though I would tend to agree with those in IT that hold up overall increased “up time” and decreased maintenance in support of web only cloud services (Google Docs, Calendars, etc. ), there still seem to be plenty of anecdotes like yours that point out huge flaws in having all of your data existing only in the cloud. I’m a huge fan of syncing services (Box.net, Google Drive, etc.) that still give me access to data if my connection to the cloud is severed. Regardless of which type of service a company is providing, I would hope they could use Google’s example as both good and bad; while they are slow to update the Apps Status Dashboard, at least they do provide some indicators of what’s going on and when to expect service to be restored once they do update the Dashboard with news. Ben, one thing that people don’t necessarily point out is that the only reason we are all talking about it is because so many people use it. If I were hosting our school email services internally and it was only our mail went down for 4 hours, (far longer than today’s Google outage) no one would be tweeting en-masse about the evils of maintaining a local email server. It would pass as just another techno glitch that “happens” and the world would go on. The same goes for file storage and collaboration services. You are correct that the benefits from an IT management perspective of cloud services are enormous, I think using a phrase such as “huge flaws” needs to be kept in perspective. A 5 minute outage at Google effects millions thereby multiplying the “perceived” impact. I’m not defending Google or saying that it’s acceptable to have an outage of any length of time, but I am suggesting that the overall local disruption is never really as bad as people claim. Good perspective on this, Pete. Perhaps “huge flaws” is a bit of hyperbole, but when a 5 minute outage can affect millions of users, I’m not sure if that impact can stay safely in the “perceived” category. The issue with cloud services going down is that it’s no longer local disruptions; people are collaborating and working with one another across the country or the planet. Down time for collaborative cloud services means a lot of lost global productivity, not just localized problems. It’s a great time to be in technology and education despite it all. We are the pioneers paving the way for the future and there is a price to being a generation of beta testers.